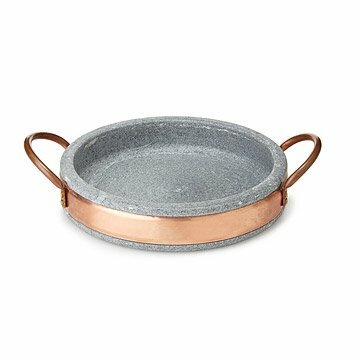 Go from oven to table in Old World style with this soapstone serveware, highlighted by copper detail. Family meals get an Old World upgrade with this beautifully handcrafted saute pan. Highlighted by a hammered copper handle, this soapstone design serves as a timeless oven to table essential. Soapstone emits no odor and is able to withstand temperatures of up to 1000 degrees Celsius, making it a versatile addition to your cooking arsenal. Handmade in Brazil. Complete your soapstone collection with the Soapstone Pot with Copper Handle, Soapstone Pizza Pan, and Soapstone Stew Pot with Copper Handle. Hailing from the city of Ouro Preto, Brazil, Valquiria and Miltinho Lopes Silva both came from families involved in soapstone mining. The couple started their own company making soapstone cookware, and today they employ 20 artisans, all of whom grew up with soapstone and currently earn the same salaries as the founders. In addition, Valquiria and Miltinho are commited to teaching younger generations their skills. Such a beautiful piece and easy directions to follow. Can't wait to cook more on it. It's beautiful, unique, and is a perfect fit for this home.